Forget Blackberry Messenger – the new app for fast-typing teens who love hyperactive communication could be Facebook chat. Okay, we know it’s not new, but Facebook have just released an app in the US dedicated soley to instant chat with their Facebook contacts. It’s on iPhone and Android. Like BBM it allows for group chats between people, it will send push notifications and will be free – well – done over the internet. It’s not out in the UK yet, but they promise it will arrive shortly. One nice feature is that you can reach friends who aren’t even on Facebook – you just need them in your phone contacts and it will send them a text. 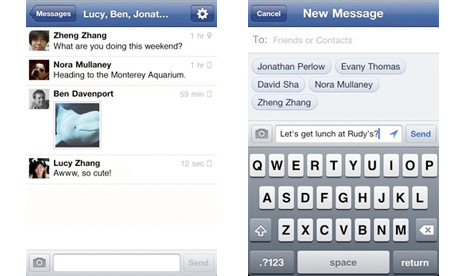 You can share your location too and messages on Messenger will stream into your history of Facebook messages and chats. The Messenger app is an extension of Facebook messages, so all your conversations are in one place, including your texts, chats, emails and messages. Whether you’re on your phone or on the web, you can see the full history of all your messages. It’s an extension of Facebook Mail – a feature Facebook gave us a lot of hype about last year which combines Facebook with your email and lets you Facebook message from your email and vice versa. So far – it has proved well-designed and useful – though not exactly mindblowing. And hasn’t, by any standards, replaced email. Poll: Should people be arrested for inciting violence on Twitter? Anonymous Vow to Take Facebook Down: But Why? Thanks for providing such a great article,Thank you for sharing the information.I like it very much.it is of vital importance for me.